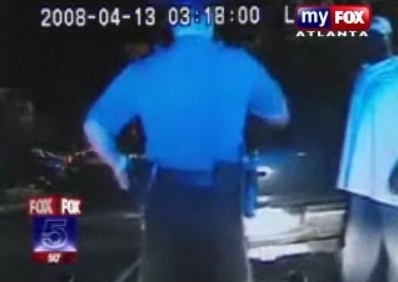 After Worley exits the vehicle and appears calm, the cowardly officer accuses him of “making fists” when Worley is doing no more than crossing his arms. Apparently, incorrect body language is now an offence that justifies “pain compliance” correction by means of a Tasering. Worley even puts his palms together in a prayer-like pose in an attempt to reassure the officer he is calm but that is not good enough, after Worley points at the cop for half a second, the officer then approaches Worley who backs away but is then Tasered.